How do we close the gap in college attendance between children from low-income families and those from middle and upper-class backgrounds? Existing research shows that providing financial support is critical to helping students afford college (and feel financially comfortable enough that they choose to attend), but new studies suggest that money alone may not be sufficient. A cross-national analysis shows that while out-of-pocket educational costs for low-income college students are lower in the U.S. than in Canada, significantly fewer young adults from low-income backgrounds attend college in the U.S. The gap between the share of young adults from the lowest income bracket who attend college and the share from the highest income bracket who attend is about twice as large in the U.S. as in Canada (20 percentage points versus 45 percentage points). This pattern persists despite the fact that educational costs for low-income students are lower in the U.S. than in Canada** and even after controlling for other differences between Canadian and American students. While financial aid is obviously critical to making it affordable for low-income students to attend college, it is not enough to close the gap between low- and high-income students (if it was, we would expect to see a smaller gap in the U.S. than in Canada). Another set of studies looks at the impact of students’ college savings on their likelihood to attend university. The researchers find that young adults from low and middle-income families who, as teenagers, set aside their own savings to pay for college are almost twice as likely to end up attending school as those who don’t. Further exploration reveals that this finding only holds true for students who, as teenagers, report being fairly certain that they will one day graduate college. For those who report being unsure whether they will graduate from college, saving money for university has no impact on whether they eventually attend. Both of these studies suggest that financial support, while extremely important, is not enough to close the college attendance gap. 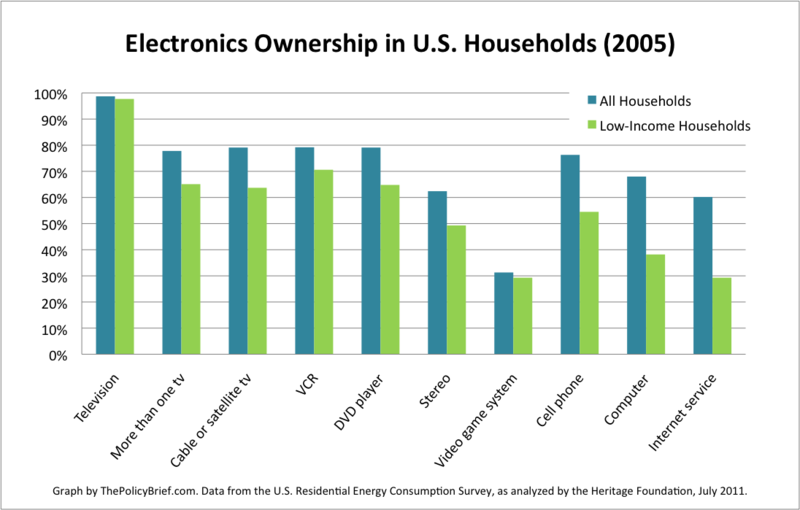 Attitudes, self-perception, and other non-economic factors continue to play a role. As advocates press for increased financial aid and funding for programs like CDAs that help young people save for college, they should consider what efforts might complement these financial supports by helping students envision themselves as people who can and will attend college. ** There is a common perception that attending university costs much less in Canada than the U.S., but this is true mainly for students from middle and upper-income backgrounds. While America’s private colleges are much more expensive than Canada’s colleges, when you look at public schools the difference is smaller. In addition, the U.S. government provides more generous financial aid to low-income students, which more than offsets the difference in costs, while Canada provides more generous aid to middle-income students. Monday marked the fifteenth anniversary of the landmark 1996 welfare reform, passed with support from both the Republican “Contract with America” Congress and President Bill Clinton. Experts and journalists have been weighing in this week on the reform’s successes and failures, particularly during the current recession. The basic political belief driving the ’96 reform was that giving low-income people money is counterproductive because it encourages dependence on the government and reduces recipients’ incentives to work. The solution? Require welfare recipients to work (or participate in job training/job development) and place limits on how long they can collect benefits. Just as important as the reform’s stricter requirements for welfare receipt were its changes to the structure of the program. 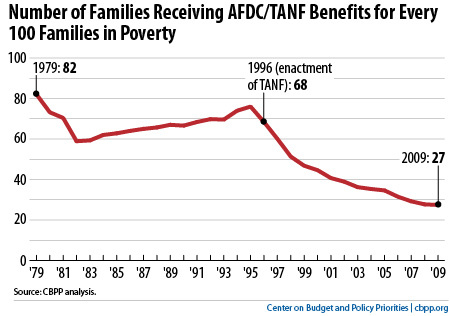 While the previous program, AFDC, was an open-ended entitlement with no funding cap, its replacement, TANF, receives an annual block grant of $16.6 billion in federal funding, an amount that hasn’t changed in 15 years. The ’96 reform also gave states more flexibility in how they administer the program. 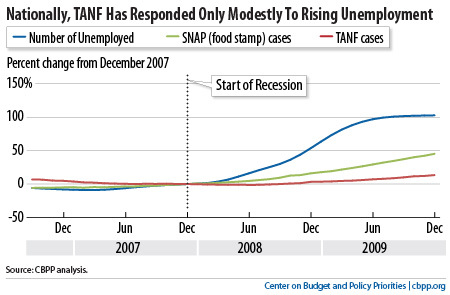 TANF has indisputably succeeded at one of its goals: cutting the welfare rolls. Welfare caseloads have declined 60% since 1996, even though the number of families in poverty has been increasing since 2000. While conservatives may laud the reduction in welfare cases, it doesn’t mean that fewer people are poor, just that fewer of them are accessing benefits. In 1996, 68% of families living in poverty were receiving welfare, while in 2009, the figure was just 27%. Expert opinion on the success of welfare reform in actually reducing poverty is mixed: most agree there was a significant impact in the first few years but many argue that these early gains were almost entirely undone in the past decade. Ron Haskins, an architect of the legislation now at the Brookings Institution claims it has “been quite successful.” He points to increased employment among women with low-education levels and reductions in child poverty in the first five years after the reform. 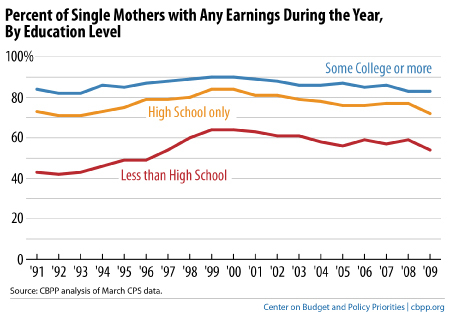 But many claim these early gains were a product of the booming economy of the late ‘90s more than welfare reform. As LaDonna Pavetti at the Center for Budget and Policy Priorities shows in the graph below, the employment gains among women have steadily disappeared since 2000. On the poverty front, the percentages of children (20.7%) and families (12.5%) living in poverty in 2009 were almost exactly the same as in 1996 (20.5% and 12.2% respectively). The rates were, however, lower before the current recession began. In 2007 they were 18.0% for children and 10.8% for families, better than in 1996 but not as good as 2000. The Heritage Foundation, who played a significant ideological role in shaping the ’96 legislation, offers an interesting take on the reform’s success. They claim the spirit of the reform – discouraging dependency and encouraging work – is no longer being implemented and that’s why it hasn’t worked, though they don’t offer much concrete proof of this perspective. To me, the evidence suggests that during the strong economy of the late 1990s, stricter eligibility requirements and more flexibility in program administration helped encourage some poor people to work and lifted some families out of poverty. But a good part of these gains were undone when the economy slowed and jobs became scarcer in the 2000s. And when the economy collapsed in late 2007, not only were previous gains lost, but the new welfare model was ill-equipped to help families who were struggling in the recession. I’ll have a post tomorrow on this last point, exploring how welfare has (or hasn’t) worked during the current recession.